Get an up-close look at Texas A&M's 1939 throwback uniforms, including their 'leather' helmets and adidas cleats. Texas A&M is going old-school for their game against University of Louisiana-Monroe this weekend, and adidas has unveiled a new throwback uniform for the Aggies. Designed to look like the uniforms of the 1939 National Champion A&M squad, it features a simple maroon jersey and basic cream pants. The coolest thing about the new uniforms are undoubtedly the helmets, which have been designed to look exactly like the leather ones sported by the 1939 team. Of course, the helmets aren't actually leather (because no one likes concussions), but they look awesome. 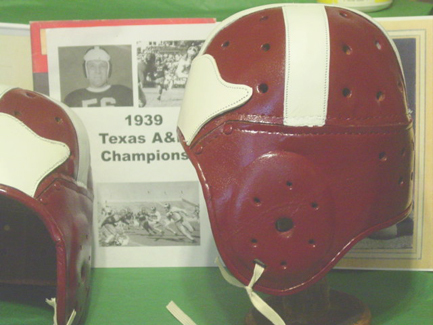 "Texas A&M's helmet, produced in concert with Hydro Graphics Inc. and Riddell, is dark maroon with a hydro film leather-like texture featuring wing and cross graphics created using high-resolution photographs of an actual helmet worn by the 1939 team," adidas said in a press release. Another neat aspect of the uniforms are the cleats, which have been designed to look like old-school leather football cleats. "To complete the head-to-toe look, the Aggies will wear adidas cleats designed in a dark brown throwback style with a premium tumbled leather upper and metal eyelets," adidas said. Although the uniforms look old, they feature the newest adidas technology such as TECHFIT Shockweb technology.